To keep improving machine performance, stay competitive, improve precision, limit machine downtime and shorten the work process to save time and increase productivity. To equip the machines TECOI produces with easy-to-programme FANUC series 31i CNCs. 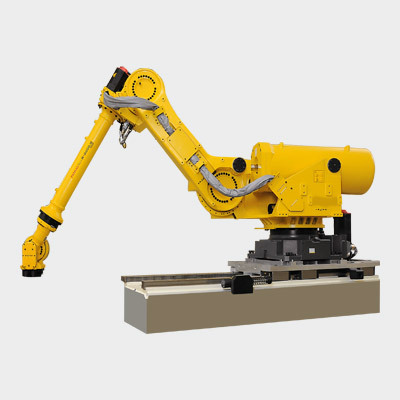 Install FANUC robots to unload finished parts. Equipped with a claw that has 40 independent suction cups, these robots pick and place parts on pallets ready for packing. 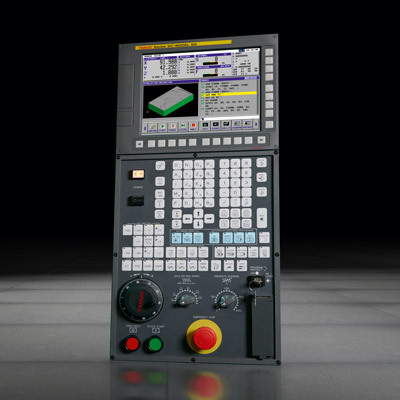 Productivity and precision were improved thanks to the introduction of FANUC high performance numerical controls on TECOI’s range of machines. Likewise, adding FANUC robots helped streamline handling processes and increased throughput. "FANUC—says Tecoi's CEO, Jorge Rodríguez—was chosen mainly for the accuracy and versatility it could offer in a great variety of tasks, such as bevelling. Once we implemented bevel heads on our machines they imposed more demanding requirements, which the controls used until then could not provide. A more powerful numerical control that could perform more tasks was needed to control a series of functions such as bevel cutting, sheet height control, improve the engines' precision and the ability to coordinate movements in 6 axes…"
TECOI, renowned specialist in designing and producing cutting machines, has found in FANUC the perfect partner to develop innovative and highly competitive machines and productions systems. Numeric control and automation have played a fundamental role in achieving the objectives set in its business strategy. TECOI was founded in 1995, in Valle de Sabero de León, as the result of the merger between two companies, one specialised in manufacturing automated machinery, the other focused on developing technical solutions in the metal industry. This combination of human and technical resources is what inspires the company to invest in innovation and in its own design of all the machines and parts it produces. Initially its focus was mainly on designing, manufacturing, installing and maintaining industrial plasma and oxy-fuel cutting machines and tables. Later it expanded its product range to laser cutting machines and combined machines of sheet metal cutting and machining and welding edge preparation. The latest generation of tooling machines was an improvement in the cutting process, as they complemented the previous models. In some welding edge preparation applications and in specific industries it's important that certain set conditions are met. For example, it's best not to employ thermal treatment methods for welding edge preparation in the wind power industry, as the heating may alter the properties of the materials. To solve practical problems such as these, the company has adopted machining for drilling, rigid tapping and milling. Most importantly, every machine currently produced can be configured according to each client's specific requirements. To keep improving the machines' performance it needed to equip them with controls that would allow them to operate with increased precision and reliably. That was when the alliance with FANUC started and why today it still plays a fundamental part in the company strategy. "FANUC—says Tecoi's CEO, Jorge Rodríguez—was chosen mainly for the accuracy and versatility it could offer in a great variety of tasks, such as bevelling. Once we implemented bevel heads on our machines they imposed more demanding requirements, which the controls used until then could not provide. A more powerful numerical control that could perform more tasks was needed to control a series of functions such as bevel cutting, sheet height control, improve the engines' precision and the ability to coordinate movements in 6 axes…"
In this field, FANUC's extensive experience in automation solutions contributed greatly, adding value to Tecoi's cutting expertise. A perfect alliance. Plasma and oxy-fuel operations, laser cutting and machining, mainly drilling, rigid tapping and milling, all can be controlled using one high performance numerical control, the 31i. "Furthermore—says Marcos, Purchasing Director at Tecoi—we have optimised the production process and have gone from assembling a NC in forty hours, to assembling it in just six". Another strength of FANUC's controls is that they are easy to program and use. Tecoi has developed its own software that is very versatile and intuitive to use: CISCAD. Its main characteristic is the ability to work using different types of cutting techniques depending on the cutting job required. This allows cutting holes at different speeds and depths compared to the edges. The CISCAD software works perfectly with FANUC 's control functionalities giving great reliability to the system. It also uses other programmes for sheet handling, automatic nesting, task management, casting parameter development, cost management, etc. "The advantage of having a control like the 31i is that we can implement it in the machines we produce ourselves as well as in those that we reconvert"—added Marcos. Personnel training is another essential service that FANUC thoroughly guarantees together with technical assistance. In the industrial world, being able to manufacture a machine at a reasonable price isn't enough, you have to keep improving it and making it more competitive. When this type of machines is employed in mass production, the time needed to load and unload the materials affects productivity. The objective is to limit the machine's downtime as much as possible and shorten the work process to save time and increase productivity. Again, Tecoi was able to rely on FANUC's expertise in this context. It provided a robot to load and unload the parts and automate the process. To unload finished parts, the robot has been fitted with a claw that has 40 independent suction cups and depending on the parts it has to unload, it has the exact information it needs to automatically pick them up and place them on pallets ready for packing. Bevel cut parts don't come out directly and require a little manoeuvring to be picked up and piled. Before picking up each part, the robot is provided with the information it needs to recognize it and operate the appropriate suction cups to pick it up. "A double improvement—said Rodríguez—as on one side FANUC helped implement high performance numerical controls in our range of machines, and on the other it allowed us to include a robot to load and unload materials and therefore increase our productivity significantly". Automating the process has brought improvements in many areas. Mainly it helped optimize and standardise the production process, which resulted in constant cycle times and productivity levels. It also improved working conditions. However, despite Tecoi's improvements, the challenge remains. It's important to continue developing new functions to respond to new needs and find solutions to increase speed, productivity, etc. There is still room for improvement and Tecoi and FANUC will continue working together to achieve it, for the benefit of the metallurgical industry. The market doesn't just demand competitive prices; it wants flexibility, ability to innovate, reliability and quality. These are our objectives and we are confident that together we will soon be able to offer new effective solutions.